The best time to plant a tree is twenty years ago. The second best time is Arbor Day. Florida recognizes the event on the third Friday in January, but planting any time before spring will establish a tree quickly. The idea for Arbor Day in the U.S. began with Julius Sterling Morton. In 1854 he moved from Detroit to the area that is now the state of Nebraska. J. Sterling Morton was a journalist and nature lover who noticed that there were virtually no trees in Nebraska. He wrote and spoke about environmental stewardship and encouraged everyone to plant trees. Morton emphasized that trees were needed to act as windbreaks, to stabilize the soil, to provide shade, as well as fuel and building materials for the early pioneers to prosper in the developing state. Today, all 50 states in the U.S. have official Arbor Day, usually at a time of year that has the correct climatological conditions for planting trees. For Florida, the ideal tree planting time is January, so Florida’s Arbor Day is celebrated on the third Friday of the month. Similar events are observed throughout the world. In Israel it is the Tu B Shevat (New Year for Trees). Germany has Tag des Baumes. Japan and Korea celebrate an entire week in April. Even Iceland, one of the treeless countries in the world observes Student’s Afforestation Day. The trees planted on Arbor Day show a concern for future generations. 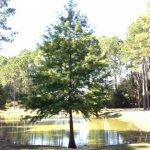 The simple act of planting a tree represents a belief that the tree will grow and someday provide wood products, wildlife habitat, erosion control, shelter from wind and sun, beauty, and inspiration for ourselves and our children.